For many, the idea of putting something on our skin that we’d normally put onto a salad sounds… insane. But once you get over this mental hump – you’ll find the idea of using overly fragranced, chemical-laden lotions even crazier! Vegetable oils are natural emollients, packed with vitamins and nutrients recognised by our body. Your skin will not only be soft, but also nourished. If like me, you find yourself shopping for skincare in a supermarket aisle, I promise you’re not crazy and you’re not alone! People have used plant oils as skincare for centuries – we just seemed to have forgotten – so, let’s change that! Take a look at these six simple oils. Everyone’s skin is different and finding the right one means experimenting. You can use them directly on the skin, to make a scrub or body butter, or add a few drops of oil in rosewater or aloe vera juice for a moisturising spray. The best part is that if for any reason your skin doesn’t like a particular oil, there’s no waste. Just go back to making that salad! Try one out, and see if it works for you! A neutral scented oil, light enough to use all over the skin, on the face and body. It’s packed with vitamin E which is incredibly healing and protective on the skin. how to use this oil: Makes a great base oil for making body oils, body butters, body scrubs, creams or to use directly on the skin as a moisturiser. An incredibly nourishing oil, we’ve been using it as skincare for a long time now! The ancient Egyptians knew what they were doing – they prized olive oil for it’s moisturising and beautifying properties. Olive oil has major antioxidants which work to heal, protect, nourish the skin. how to use this oil: Great for skin and hair, you can apply it on directly or use it in any of your skincare recipes that call for a natural oil. One of my favorite oils – it’s great for both skin and hair. 50 percent of Coconut oil is a fat called Lauric Acid, which is naturally found in human breast milk – making it easily recognised and useful for our bodies to nourish and protect the skin. It’s incredibly antimicrobial, which cleanses the skin as well. how to use this oil: You can use it directly on the skin, it makes a great eye-makeup remover. It’s also great to mix into your skincare recipes and it makes a great intensive hair moisturiser – but don’t use too much, you’ll spend days washing it out! A rich and lovely oil for the skin and hair, it’s very nourishing full of protein, fat and antioxidants. It helps to treat skin conditions like sunburn and diaper rashes, it boosts collagen production and softens the skin. how to use this oil: This is great to moisturize under the eyes, to treat dry skin and as protein rich hair treatment. You can blend it with other oils or use it on it’s own on trouble spots. Macadamia oil is interesting because it has a high fatty acid profile. This helps with cellular regeneration, giving it anti aging properties. It’s light weight/medium oil that doesn’t feel greasy on the skin, but has a great moisturizing effect. how to use this oil: use this oil for very dry skin, to treat dry patches or soothe skin conditions. You can mix in a little with another oil to boost moisturizing properties. it’s great to add into your recipes to create anti-aging remedies. A light oil, extracted from the seeds of grapes left over in winemaking. Grapeseed oil is packed with Vitamin E, a powerful antioxidant and skin brightening vitamin C. It helps to nourish the skin and balance the skin’s oil production – making it great for acne prone skin. how to use this oil: Grapeseed oil is very light and non-greasy, so you can use it directly on the skin. Many people like using it on their face and for under the eyes. The brand of oil doesn’t matter as much as how the oil was expressed. Chemical and heat destroy the oils natural properties, so always buy: Cold-pressed, Virgin and unrefined oils only. Read the label and make sure it says it! I have broken capillaries on my face can grapeseed oil help in fading them away? Or what other ouls can diminish all the red blotches? I have broken capillaries on my face can grapeseed oil help in fading them away? I am happy I found this blog!. I am just one starting to make my own skin care products from scratch at home. It was nice to learn about some oil that I can use on my recipe. Thank you! I make sugar scrubs (4 oz jar) with extra virgin olive oil and wanted to add some avocado oil to help with my dry skin. Do you have a recommended amount of the avocado oil I should mix with the olive oil, to help with the dryness? Hi Amy! Avocado + Olive is a wonderful combination for dry skin! I might do a 50/50 ration… but A good idea is to apply the oils directly onto your skin as an experiment: maybe avocado on your left arm. Olive on your right arm – so that you can see how each oil feels on your skin. If you find that you like the feel of one more than the other, or if one absorbs better, moisturises better – you can decide the ratio for your scrub. Hope that helps! Happy making! 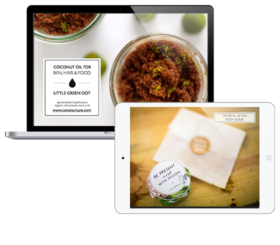 Such a lovely blog…(although I would also note that coconut oil can clog pores and cause excess sebum etc, so be careful of that one on your face). hey – love your blog! would you recommend coconut oil or is vegetable oil preferable for a facial moisturizer? or even something else? thanks! Hi there! I just started to use oil on my face, can i mix vitamin e oil with my olive oil and lavender oil mix? How about sunflower seed oil?